BOSTON, Feb. 28 /CSRwire/ - MENTOR: The National Mentoring Partnership released a research-backed, youth-informed guide to unpack a timely and critical topic: Toxic masculinity. Conversations About Masculinity: How Mentors Can Support Young Men of Color was released during MBK Rising!, the Obama Foundation’s My Brother’s Keeper’s Alliance first national convening of the growing network of MBK Communities working to provide boys and young men of color safe and supportive communities and pathways to opportunity. 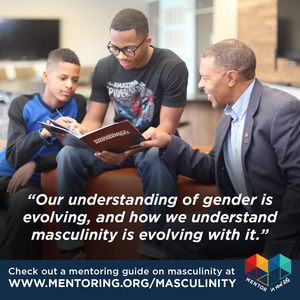 The guide, a one-page summary, and other resources are now available at www.mentoring.org/masculinity. MENTOR: The National Mentoring Partnership is the unifying champion for quality youth mentoring in the United States. MENTOR’s mission is to close the mentoring gap and ensure our nation’s young people have the support they need through quality mentoring relationships to succeed at home, school, and ultimately, work. To achieve this, MENTOR collaborates with its network of Affiliates and works to drive the investment of time and money into high-impact mentoring programs and advance quality mentoring through the development and delivery of standards, cutting-edge research, and state-of-the-art tools. MENTOR is the lead champion for youth mentoring in the United States. We serve young people between the ages of 6 and 18, and MENTOR's work over the last two decades has helped millions of young people find the support and guidance they need to build productive and meaningful lives.